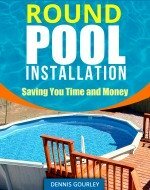 When you install a deck on your above ground pool you have the choice of adapting your original ladder or buying a deck ladder. 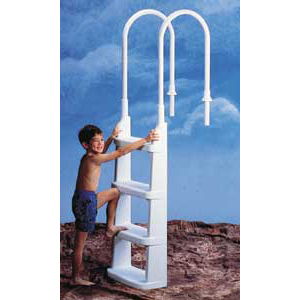 Another name for this type of ladder is the in-pool ladder. These ladders are made to be mounted onto a deck and used in a vinyl lined pool. As you can see in the photos of some decks we have built, the outside ladder is made of wood and is part of the deck. You do however, need a way to get in and out of the pool. Deck ladders are a one sided ladder that range from simple and inexpensive to elaborate and very expensive. Below are a few examples. This is my all time favorite deck ladder. I have used these myself and have also installed them on customers decks. It is simple, very liner friendly and the price is right. 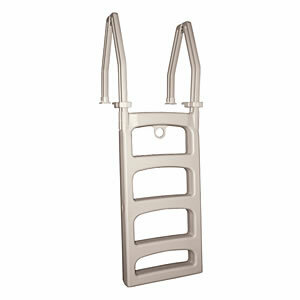 In The Swim carries all of these deck ladders and is well known for having the best prices on the internet. 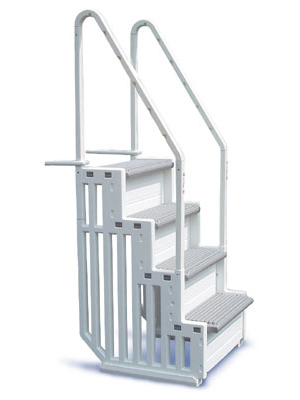 If you are looking for something a little sturdier in a deck ladder this one should work. The steps are bigger and would work better for elderly people and maybe small children. The biggest advantage with this ladder is the side blocking. Automatic pool cleaners love to get wrapped around pool ladders. Having guards on the sides of the ladder prevents this from happening. I have seen this type of in-pool ladder damage the liner. I would recommend a Ladder Pad under the inside of any vinyl pool ladder. Be very careful the notch for the cove does not rub on the liner and securely mount the unit. If it is padded and secured this is an excellent choice. This is my least favorite among the three. The A-frame version of this ladder has always been on the flimsy side and I don't see this as being much different. The parts that might give you trouble are the deck mounts and the joints to the steps. I have not used the actual deck mount version of this ladder and if I am wrong please correct me. Deck ladders are just one way of getting from your pool to the deck. Above ground pool steps are another way to do it. That is, however, a topic for a different page.